head piece, 62.5cm (24.6'') in length, 41.5cm to 35.7cm (16.3'' to 14'') in width, and 14.5cm (5.7'') in depth. 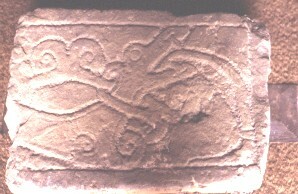 Grave-cover in two pieces, dated to the tenth century. This is the head piece. Lang, J., Corpus of Anglo-Saxon Stone Sculpture, Vol. 3, York and Eastern Yorkshire. 1st, Oxford University Press, Oxford. (1991) Crosses, Sculpture, Anglo-Saxons, England..